The 44RPM Blues is the second aluminum release from 44RPM, the start-up company from Drew Tetz and 3x World & National YoYo Champion Hank Freeman. 44RPM launched with a load of “flatpack” toys…yoyos, kendamas, and spin tops that are laser cut from a single sheet of wood and then assembled by the player. The Blues is their signature edition yoyo for co-founder Drew Tetz. The 44RPM Blues is a huge, ridiculous yoyo that is almost guaranteed to be the most fun and unique throw in your entire collection. The huge diameter juxtaposed with a totally reasonable weight means that without the wooden weight rings, the Blues is huge and floaty, and plays in a way that is best described as “round”. Add the included laser cut wooden rings and the Blues picks up a little extra spin time and the play goes from “round” to “fat”. Trust me…once you actually play with a Blues, this all makes perfect sense. Only a yoyo this strange and wonderful could be suitable as the signature model for 2014 Trick Innovator of the Year Drew Tetz. Available in solid colors with art created by Rodrigo “Whip” Yokota, the Blues makes use of laser cut wooden rings to give it a truly unique look. The combination of a rich red anodizing with the burnt wood of the rings makes the Blues look classy and interesting…I can’t speak for how the other colors will look with rings, but I suspect they’ll be fantastic as well. The anodizing is solid, without flaws, and the art is bold and cleanly engraved. The 44RPM Blues retails for $55, which is plenty reasonable for a great playing modern aluminum yoyo, and a total bargain for something that is truly unique in the market. There is no other yoyo available that looks or feels like the Blues, and it’s worth the $$ just to have one handy for the sake of variety. The 44RPM Blues is available through YoYoExpert.com. The Boss is the latest entry-level metal yoyo from YoYoFactory, and is designed and intended to be a great first metal yoyo for players who are new to unresponsive play. The YoYoFactory Boss is stable and forgiving, two things that every beginning player needs. The small size makes it a fairly quick player, and the shape is comfy in the hand and easily maneuverable on the string. If you’re used to a full-sized yoyo, it will take a few minutes of play to get used to the smaller diameter and slightly different throw/unwind of the Boss, but once you’re dialed in even an experienced player will find that this is a small, zippy, and really fun knock-around yoyo. Available in solid colors with a simple engraving, the Boss has a clean, simple look. The anodizing is nice and the engraving is clear, and the YoYoFactory Boss is available in Red, Blue, and Black. The YoYoFactory Boss retails for only $30, making it a fantastic deal for any player looking for their first unresponsive metal yoyo or any experienced player looking for a beater they can throw in a jacket pocket and not worry about damage from Walking the Dog to impress the ransoms. 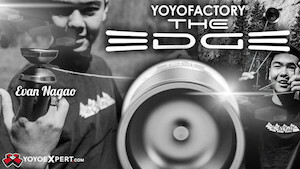 The YoYoFactory Boss is available now at YoYoExpert.com. The Rhythm is the first aluminum release from 44RPM, the start-up company from Drew Tetz and 3x World & National YoYo Champion Hank Freeman. 44RPM launched with a load of “flatpack” toys…yoyos, kendamas, and spin tops that are laser cut from a single sheet of wood and then assembled by the player. The Rhythm is their first player-centric release, and was designed with help from World YoYo Champion Rafael Matsunaga. The 44RPM Rhythm is fat, floaty, and fun! Designed to be equally great for competition and every day play, the Rhythm is a perfect first aluminum release for a company like 44RPM. It’s got the spin time and stability that you expect from modern aluminum yoyos, but it plays fast and light and feels extra comfortable in the hand. It’s hard to describe how this plays in relation to other yoyos…the best way to describe it would be to say that it plays like you’re sitting in a comfortable, overstuffed chair. It feels almost weightless on the string, has crisp and clean binds, and can handle everything from goofy picture tricks to top-level 1A/3A/5A play. The Rhythm is the perfect yoyo to remind you how much fun yoyoing can be. Available in solid colors with art created by Rodrigo “Whip” Yokota, the Rhythm keeps it simple and fun. Never meant to be a “collectors item”, the Rhythm was designed to be a knock-around yoyo that gets used, so don’t expect much in the way of fancy anodizing and limited editions. The anodizing is solid, without flaws, and the art is bold and cleanly engraved. The 44RPM Rhythm retails for $42.50, which is plenty reasonable for a great playing modern aluminum yoyo. Priced with 3A players in mind, the Rhythm is a great deal for 3A players looking for a new pair, or a casual player who just wants something new and fun. The 44RPM Rhythm is available through YoYoExpert.com. The Yoyofficer Tusk is the latest mono-metal release from YoYofficer, and this full-sized yoyo brings a ton of play value with a really big feel in the hands and on the string. The YoYofficer Tusk offers a full-sized body with a classic “H” shape, and it’s every bit the big, meaty throw you would expect from a yoyo with these specs. The Tusk is deceptively light for a full-sized throw, and feels big and fast on the string. There’s something more fun about playing with a yoyo that feels larger, and the Tusk definitely brings more fun to your collection. It’s got the spin and stability that you need, with a blasted finish that is amazing for grinds. The open inner cup lends itself well to fingerspin tricks, and the secondary bump inside the cup pushes some weight to the center of the yoyo, giving it a more balanced overall weight distribution and a smoother throw. The Yoyofficer Tusk is available in a nice assortment of splash and wash anodizing. The fit and finish on this yoyo is great, with bright, vivid colors on the anodizing and sharp, clear engraving. The detailing on the inner cup is really nice, and gives some extra depth to the design, especially the detail rib around the cup’s step. Overall it’s a great looking yoyo with some nice color options. The YoYofficer Tusk retails for $40 – $45, making it a highly affordable casual purchase for anyone who likes a beefy “H” shape and is looking to get into the YoYofficer product line. At this price, the Tusk is a great option for players of any skill level looking for something new. The Yoyofficer Tusk is available now through YoYoExpert.com. The Yoyofficer Shift is the second bi-metal release from this small Chinese company, and a fantastic throw for the price. With a wide catch zone and a comfortable, semi-organic body shape, the Shift is fun and comfortable throw with all the power you need. The YoYofficer Shift is small and light, but brings a ton of play value to its price range. The soft v-shaped body has a huge catch zone, enough to really facilitate even the riskiest horizontal tricks with ease. The overwhelming majority of the Shift’s weight is in the steel rims, which gives it a solid feel and powerful spin that you wouldn’t expect from something that only weighs in at 63 grams. The slightly rounded rims make the Shift a comfortable throw…the profile is one of the most ergonomic and friendly of the entire YoYofficer line. The Shift ships with a grooved centering bearing that really helps maximize the spin time of the bi-metal design. It’s become cliché to say that any yoyo has long spin times and plenty of stability, but only because modern yoyo design has been dialed in to the point where every reputable company has figured it out. And YoYofficer is definitely a reputable yoyo company, and the Shift definitely has plenty of spin time and stability. Available in solid colors with a simple engraving, the YoYofficer Shift keeps things classy with an understated look. The fit of the rims to the body is smooth and clean, the matte finish on the yoyo feels wonderful, and the overall look of the yoyo is elegant and simple. Small touches like the rounded transition to the flat cup, the beveled edge of the rim where the aluminum meets the steel, and the tiny flat detail that transitions the rim into the gap give the Shift a depth of design that becomes more enjoyable the more you look at it. 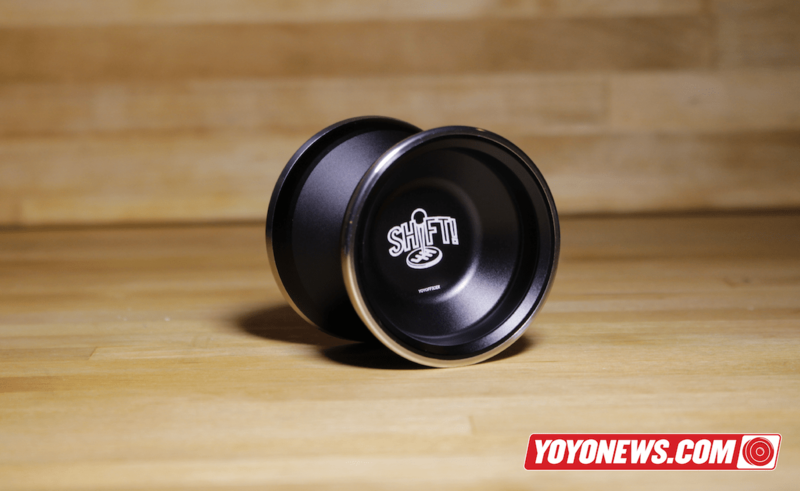 The YoYofficer Shift retails for just $75, making it an incredible deal for players looking to add a bi-metal yoyo to their collection. It’s a solid, simple design with a ton of play value at a great price…what more could you ask for? The Yoyofficer Shift is available now through YoYoExpert.com. The Mixtape is the second release from Axis YoYos, the new company from all-around nice guys James Reed and Tyler Hsieh. The Mixtape is fast, and fun with a shape that should appeal to both casual and competition players. This budget offering from Axis YoYos is a perfect offering for fans who aren’t ready to spend the money on a Pulsefire but want to support this exciting new brand. The Axis Mixtape is the first budget model from Axis YoYos, and it brings plenty of bang for the buck. This full-sized yoyo feels solid on the string and in the hand, but still moves plenty quick enough to fit any player’s style. The Mixtape feels bigger than it actually is, and plays even bigger…the combination of the large diameter with the narrower profile and good rim weight give it a nice stability and plenty of spin time even while feeling like a more relaxed, casual throw. Available in several solids and a few splash colors, the Mixtape has some nice lines and a shape that’s pleasing to both the eyes and the hand. The iconic “play button” engraving on the short, wide hub is a nice touch…just enough to set it apart while keeping the overall look of the yoyo simple and appealing. The anodizing color and quality is great, and the engraving is clean and crisp. The Axis Mixtape retails for just $39 USD, which is an amazing value for a great playing yoyo from such a young company. The Axis Mixtape is a solid choice for any aspiring 1A or 5A players…and at this price it’s worth snagging a pair for 3A. The Axis Mixtape is available now through YoYoExpert. THIS POST SPONSORED BY AXIS YOYOS. The Pulsefire is the first release from Axis YoYos, the new company from all-around nice guys James Reed and Tyler Hsieh. 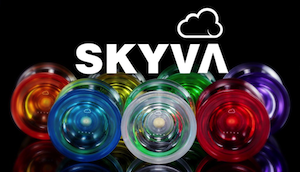 The yoyo is stable, fast, and is well-suited for the highest levels of play in 1A, 3A, and 5A styles. The Pulsefire started off as a crowd-funded project on IndieGoGo, and has quickly become a competition favorite that you can find on stage at pretty much every contest in the US. The Axis Pulsefire is an absolute contest-killer of a yoyo. With a wide v-shape profile and perfect weight distribution, the spin and stability on this yoyo are hard to beat. The combination of an ultra-light 7075 aluminum body with the stainless still rims can easily result in slow, clunky play but the Pulsefire has managed to provide extreme rim-weighting with smooth throws and light, fast play. The shape itself is quite comfortable in the hand and handles both standard and horizontal play with ease. It’s hard to describe, but this yoyo feels like the new new. 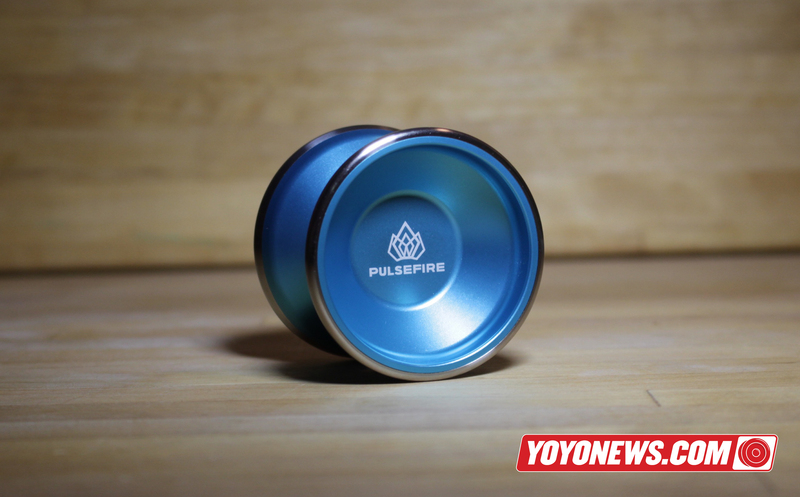 Maybe it’s the slew of young talent that has immediately gravitated towards Axis and the Pulsefire, maybe it’s the speed that this yoyo naturally seems to want to play; either way, the Axis Pulsefire has gotten a tremendous amount of stage time for a new release and it definitely deserves it. Available in several solid and splash colors, the Pulsefire has come out of the gate looking good. The anodizing is high-quality, with colors and splashes that are chosen and applied well. The fit of the stainless steel rims is perfect, and the seam where the rims meet the body is perfectly smooth and flush. The engraving is simple and clean, and the artwork is outstanding. For a new company to pay such attention to detail and actually show up out of the gate with quality graphic design and a solid brand image is pretty rare, and it’s great to see this much effort and care being put in to the final product. The Axis Pulsefire retails for $120, which is typical for high-quality bi-metal yoyos. The quality construction, anodizing, fit and finish make this worth the price, along with the fact that it can handle any trick you can throw. This is a top-notch competition yoyo, and absolutely worth the price. The Axis Pulsefire is available now through YoYoExpert. It’s that time again…another year, another glorious special edition wooden yoyo from SPYY x TMBR x YoYoExpert to celebrate everyone’s favorite fixie sage, Ed Haponik! 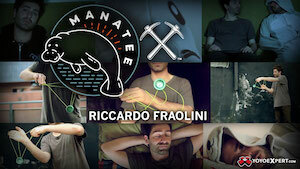 Check out the latest video from Ed and a full description of the yoyo below. YoYoExpert still has a few in stock, but once they’re gone…they’re gone. In 2012, SPYY team member Ed Haponik took a one year oath to play only a single fixed axle, wooden yo-yo. It was a custom design from SPYY who sponsored him at the time. He completed this goal as of 12/31/12 and documented his efforts on 365yoyotricks.com and in several of his clip videos. Ever since Ed has truly helped to inspire a resurgence in fixed axle play! In 2015 things have changed. SPYY is no longer around has just re-entered the game with a new Titanium Yo-Yo and Ed is still throwing the best fixed axle tricks around via his Instagram page! In hopes of continuing this amazing story we decided to approach Ed, SPYY, & TMBR. And again this year, all agreed the story and message behind this great yo-yo needs to live on. The legendary yo-yo he used, The EH, is now re-envisioned once again and available in a limited run. This year, the limited EH is crafted from WHITE oak. This wood offers a beautiful tight grain that isn’t too porous with an excellent density and smoother feel to the touch. This newest version also comes with one of the coolest axle systems out there – The TMBR Wood Thread Axles! Hand carved by Colin Leland, you will not find anything else like these on the market! After spending some time with the new 2015 EH, Ed thinks it’s the perfect fixed axle yo-yo for tricks like stalls, kickflips, varials, and lunar landings! The 2015 ‘EH’ is limited to 96 pieces and will not be reproduced. Each EH comes packaged with a special signed note from Ed and one side of the yo-yo features the EH logo engraved with the other left untouched to give it a simple clean look. Play Simply Our Friends! Start Your Fixed Axle Journey With Tutorials from Ed Haponik HERE! This post sponsored by YoYoExpert. The Bassacuda is the long-awaited signature yoyo for US National Champion, European Open Division Champion and 2-time World Yo-Yo Contest medalist Sebastian Brock. Designed with the Duncan Barracuda as the starting point and then optimized for Sebby’s unique style of play and trick construction, the Bassacuda is a fresh new beast with a totally different feel. The Bassacuda is light, fat, and fast and has a feel that really stands out in the modern yoyo landscape. The fat rims and contoured slope to the gap give the Bassacuda a wide, comfortable feel both in the hand and on the string. The light weight keeps the Bassacuda nimble and able to play incredibly fast, but the wider feel to this yoyo lends itself well to slowing down and giving your tricks room to breathe. It’s a perfect yoyo for Sebby’s style…dense, technical tricks that open up suddenly and pause for air long enough for the entire audience to see and enjoy what is happening. The Bassacuda straddles that line between competition and fun, and is a great all-around throw for any player. Available in several different editions, the Bassacuda engravings are as unique as Sebby’s tricks. 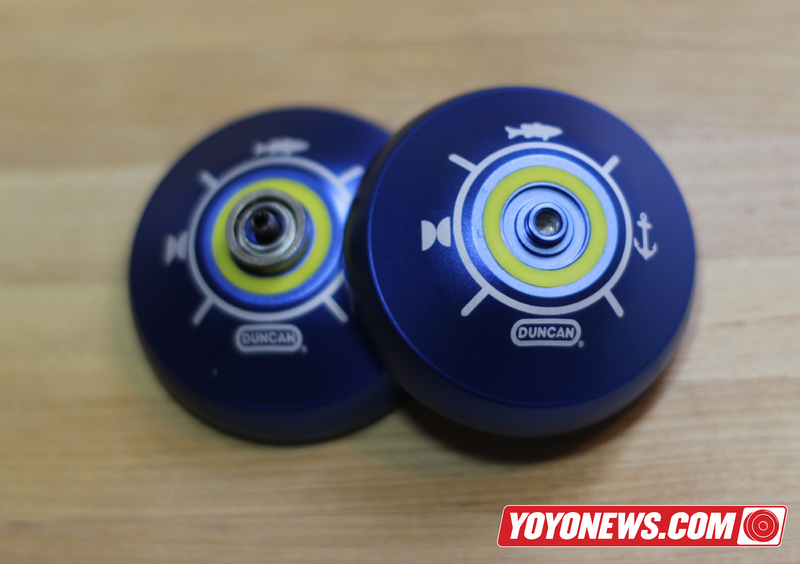 The standard edition has a nautical theme, with a ship’s wheel as the focal point of the side engraving, and with various other icons serving as compass points for a unique engraving in the catch zone of the yoyo, immediately around the response area. There have already been numerous special editions, including an understated and fantastic collaboration with Unknown. The fit and finish are far better than you would expect for a budget metal yoyo, and the various special editions really look great on a yoyo with plenty of real estate for artwork. The Duncan Bassacuda retails for $45 – $50, depending on the edition, and it’s an absolute steal at that price. Great for contests or casual throwing, with enough special editions and colorways that anyone can find something they like, the Bassacuda is the budget metal yoyo we’ve all been waiting for from Duncan Toys. The Duncan Bassacuda is available now through YoYoExpert. THIS POST SPONSORED BY DUNCAN TOYS. The YoYoFactory Mystery Box is back! 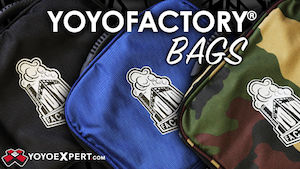 In 2010 YoYoExpert joined forces with YoYoFactory to bring you the first ever YoYoFactory Mystery Box! Selling out in seconds we knew each year had to be bigger! By far this is the most sought after release on our site and year after year the mystery boxes are that much more exciting! The SIXTH ANNUAL MYSTERY BOX RELEASE is here and we promise this is one to be excited about! But which will you choose? Box A or Box B? Regardless of your choice you won’t be disappointed with a guarantee of two yo-yos in the box! We have a special addition to the 2015 Mystery Boxes. 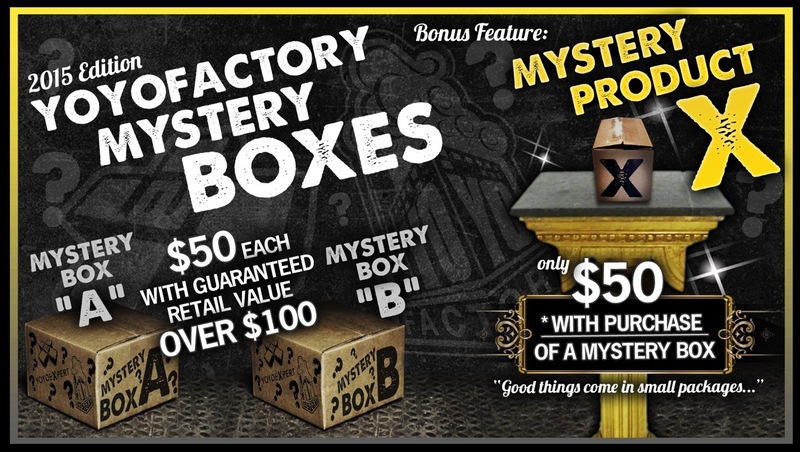 With purchase of a standard Mystery Box you can purchase the new Mystery Product X for just $50! And let’s just say “Good things come in small packages”. 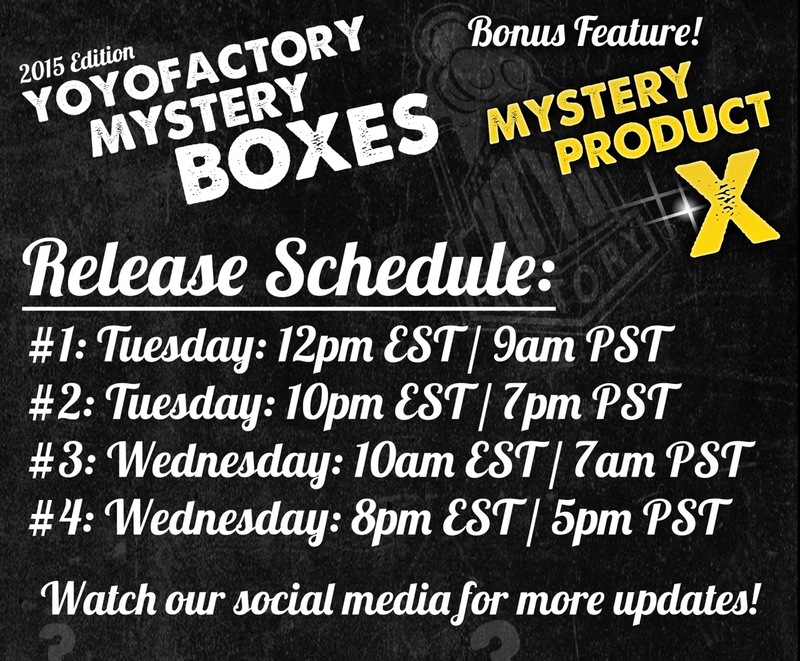 Find Mystery Box A/B Here! Find Mystery Product X Here! ALL Mystery Boxes ship FRIDAY NOVEMBER 27TH regardless of purchase date. These are EXTREMELY LIMITED and will not be around for long. This will NOT BE RESTOCKED either. Please keep in mind a purchase is only completed on the website once payment has been completed. Placing it in your cart DOES NOT reserve it for you. Only completing checkout and receiving an order number via email does. The website generally runs slow during this time due to the number of people attempting to make a purchase at the same time. We appreciate your patience and understanding! ***All Mystery Boxes are final sales. This post sponsored by YoYoExpert.com.